E I Du Pont De Nemours And Co (DD): Should You Invest in This Evolving Chemicals Giant? Chemicals giant E I Du Pont De Nemours And Co (NYSE:DD) recently reported first quarter earnings that reflected robust growth in its agricultural business of genetically modified seeds, which offset major weakness in its chemicals business. How did 210-year old DuPont evolve from a chemicals company into an industry peer of agricultural giant Monsanto Company (NYSE:MON), and what does this shift in business strategies mean for long-term investors? For its first quarter, DuPont earned an adjusted $1.56 per share, down from $1.64 in the prior year quarter, but topping the Thomson Reuters analyst consensus of $1.52. Meanwhile, net income more than doubled from $1.49 billion to $3.35 billion. Revenue came in at $10.41 billion, up from $10.18 billion a year ago and in line with the consensus estimate. DuPont’s sales rose 8% in the U.S. and Canada, and 4% in Latin America, primarily due to strong demand for its agricultural products. Sales slumped 8% in the Asia Pacific region and 1% in EMEA (Europe, Middle East, Africa). E I Du Pont De Nemours And Co (NYSE:DD)’s agriculture business, which consists of genetically-modified seeds and crop-protection products, generated 45% of the company’s revenue. During the first quarter, the agriculture segment’s revenue rose 14% to $4.67 billion, thanks to robust growth in North America and Latin America primarily attributed to the crippling drought in the United States. The drought in the central United States – the worst in a decade – convinced many farmers to purchase drought-tolerant seeds and more crop protection products to boost their yields and increase protection against insects and weeds. 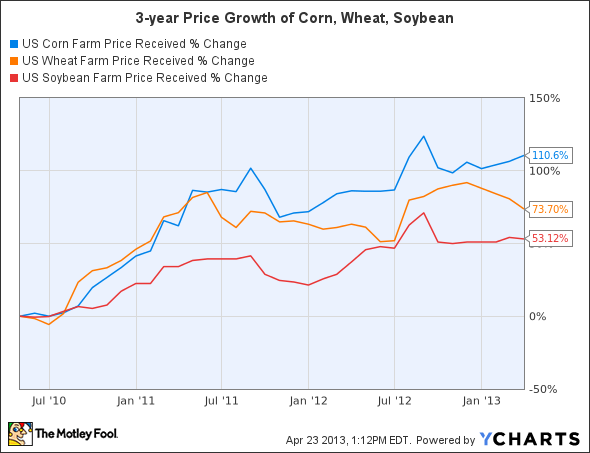 The prices for corn, wheat and soybeans have risen significantly over the past three years. This growth can be attributed to adverse weather conditions and rising global demand for these three crops, which also boosted the top-line growth of rivals Monsanto Company (NYSE:MON) and Syngenta AG (ADR) (NYSE:SYT). In 2012, extreme drought conditions across the United States caused corn yields to plunge to as low as 120 bushels per acre, which caused corn prices to surge to more than $7 per bushel, where they remain today. E I Du Pont De Nemours And Co (NYSE:DD)’s seed brand, Pioneer, rolled out 132 new GM (genetically modified) corn products for 2013, launching 36 of them last month. The addition of 27 new Optimum AQUAmax products, which are able to grow in drier conditions, doubled DuPont’s number of drought-tolerant GM seeds. A major obstacle for DuPont in its GM seeds business has been Monsanto. Monsanto’s core business relies on creating GM seeds that are resistant to its own herbicide (weed-killer) Roundup, also known as glyphosate. That pairing boosted Monsanto’s market share of the U.S. soybean and corn markets to 90% and 80%, respectively. Monsanto has patented both its GM seeds and herbicide technology. In 2009, DuPont produced the Optimum GAP soybean seed, which it genetically modified to withstand glyphosate-based herbicides, such as Monsanto’s Roundup. Although the project was later abandoned and the seeds were never sold, Monsanto sued DuPont for patent violations. E I Du Pont De Nemours And Co (NYSE:DD) then counter-sued, alleging anti-competitive practices. Last August, DuPont was ordered to pay $1 billion to Monsanto in damages. However, DuPont later settled with Monsanto, agreeing to pay the latter $1.75 billion over the next ten years in exchange for licensing rights to its genetically modified, glyphosate-resistant soybeans. Monsanto has also given DuPont access to its second generation GM soybeans, the Roundup Ready 2 Yield, which is immune to another herbicide, dicamba. 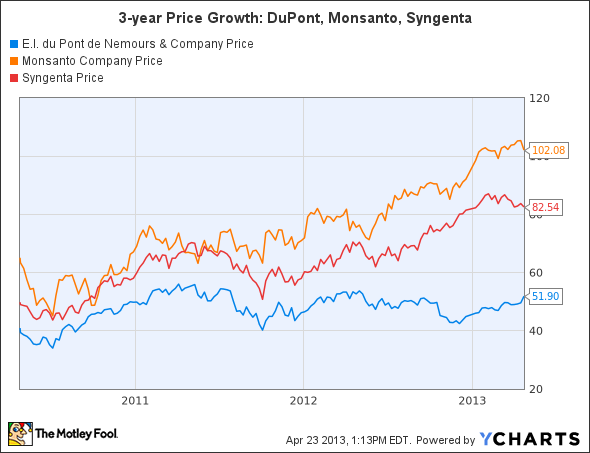 DuPont’s conflict with Monsanto is similar to the latter’s clash with Switzerland-based Syngenta in 2008. After lengthy rounds of patent litigation, the two chemical giants reached a settlement that granted Syngenta AG (ADR) (NYSE:SYT) access to Monsanto’s Roundup Ready 2 Yield technology, while Monsanto received a royalty-bearing license to Syngenta’s dicamba-tolerant technology. The clear winner after all this litigation is definitely Monsanto, but both DuPont and Syngenta stand to reap the rewards of higher demand for GM seeds, as global crop demand soars. E I Du Pont De Nemours And Co (NYSE:DD)’s acquisition of nutritional supplements maker Danisco in 2011 is also expected to improve its top line as food demand rises.